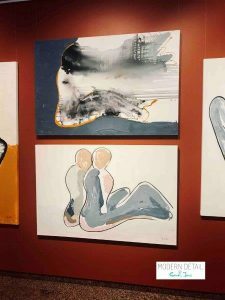 With our latest exhibition due to begin in a couple of weeks at the Intercontinental Hotel Adelaide, we have been busy putting together some new modern paintings for art collectors. Our latest on trend painting for art collectors and home interior enthusiasts named “Wind of Change,” is a beautiful contemporary art piece by Abstract Artist Sarah Jane. At Modern Detail By Sarah Jane we have a real love for all things modern and contemporary and for those art collectors that also love such works, this large painting will be a must to add to the collection. “Wind of Change” painting is 101cm tall by 152cm wide and the Artwork concept is a little unusual, instead of being based on a theme, the entire painting was based around a paint colour, Steel Blue. Using a new colour is always an exciting time for an artist, to actually see what transpires and what other colours meld well. We got the right balance with this painting with the prominent blue providing a calm peaceful vision with a touch of tan to not only outline a figure of a person, but to add a touch of warmth in order that the painting wasn’t cold and the story lost. The story of this piece is about life and the change that is always occurring amongst us. The world seems to be forging ahead ever evolving. 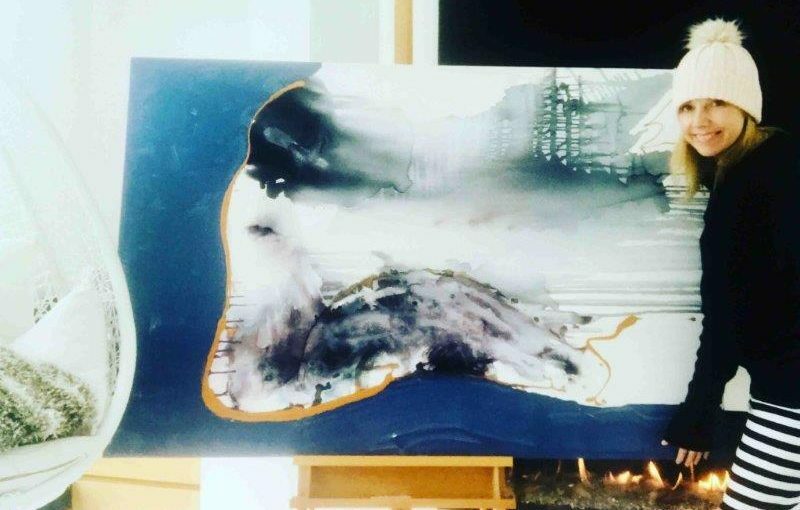 To represent the change going on around us we used a focal point of a woman sitting down as the constant, with inks used in a sweeping direction in the fashion of wind to represent the change, the variable. We love this Sarah Jane Art piece not only for its beautiful colour palette but for the meaning behind it. This painting has now sold but is still available in a print format. Take me to available modern paintings.